CUESTARS Championship Tour winner Billy Castle has won a place on the professional snooker circuit. The 24-year-old won the six most important matches of his career at Q School in Preston to earn a two-year tour card. It was a dream come true for the Reading cueman who always had the belief that this day would eventually come. “I was laid down that night trying to get to sleep and I was thinking am I still dreaming,” he said. “I was trying to pinch myself. 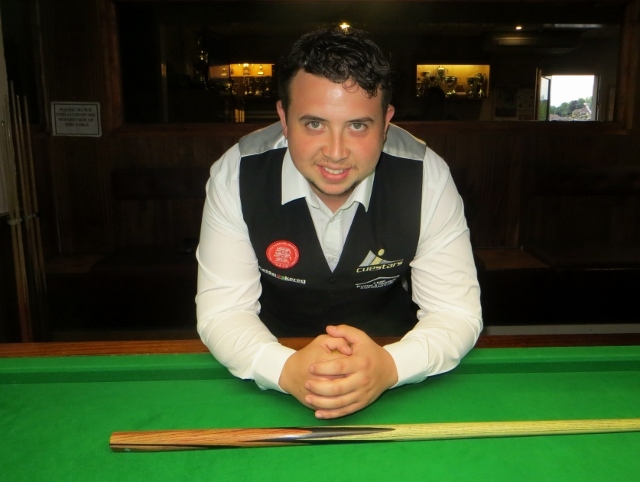 Castle earned a free Q School place worth £600 – sponsored by Frames Sports Bar, Coulsdon – by winning the Cuestars South of England Championship Tour. He needed to reach the semi-finals of either of the two events to join the pro-circuit. Following a 4-2 first-round victory over Adam Brown (Liverpool), Castle clawed back a two-frame deficit to prevail 4-2 against Jason Tart (Blackpool), the nephew of seven-time World Champion Stephen Hendry. Now on a roll and with his results being followed on mobile phones by friends and family across the south of England, he overcame Mateusz Baranowski (Poland) 4-3, Troy Brett (Ilkeston, Derbys) 4-1 and former professional Zhang Yong (China) 4-1. He now needed one more win. And that became one frame as he led another ex-pro, Paul S Davison (Pickering, Yorks), 3-0. However, Davison pulled two back. Castle compiled a 51 break in the sixth frame but nearly threw his chance away when his opponent needed snookers. While playing a safety shot on the brown, Castle cannoned the black into a pocket and left himself snookered. He failed to escape and left a free ball. But after a subsequent safety shot was poorly executed by Davison, Castle potted the brown and rolled the blue in deadweight for a famous 4-2 victory. “There were a lot of good players up there,” he said. “It was a good standard. Cuestars director John Hunter said: “The aim was to find someone who could progress through the whole structure to the professional game. “For it to happen in the first year we introduced the Q School place, I can’t really take it in. The dad-of-two, who is based at The Crucible Sports & Social Club, Newbury, returns to the Guild Hall, Preston, on May 31 for the qualifying rounds of the Riga Masters. Originally from Marchwood, Castle made his competition debut in the Eastleigh & District Under-13 League at Chandlers Ford Snooker Club at the age of ten or 11. In his second Cuestars season, a 14-year-old Castle won his first regional tournament, an Under-15 Handicap Open at Stoke Snooker Club, Gosport, on December 3, 2006.